Self-Absorbed Boomer: Sure 'n' begorrah, I'm more Irish than anything! 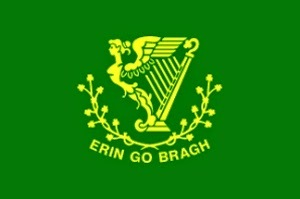 Sure 'n' begorrah, I'm more Irish than anything! What I expected my DNA to show was that I was perhaps sixty percent or so English, maybe twenty five percent Irish (with some Scandinavian mixed in, thanks to the Vikings), and the rest a mixture of Scottish, German, and maybe a few surprises from some generations back (French? Native American?). What I got as the sources of my genome was: Ireland, 34%; Scandinavia, 27%; Europe West (basically France, Germany, Switzerland, and the Low Countries), 14%; Iberian Peninsula (Spain and Portugal), 14%; Great Britain (England, Scotland, and Wales), 6%. The remaining five percent is divided among traces of Italy or Greece; Finland or Northeast Russia; Poland or Ukraine; and a less than one percent dab of North Africa, which I suspect came en suite with the Iberian Peninsula connection. I was surprised that Ireland and Scandinavia together accounted for over sixty percent of my genome, and that Great Britain, which for Ancestry.com comprises England, Scotland, and Wales, contributes only six percent. I now know this was because of my mistaken belief about the origin of the name Scales (see footnote * below), which turns out to be Scandinavian, arriving in England by way of Ireland, where some Irish may have gotten mixed with it. It's also possible that my Miles ancestors on my mother's side were of Irish origin (see footnote **** below). The Iberian connection just about floored me, as I know of no Spanish or Portuguese ancestors on either parental side. One suggestion from a co-worker is that some of my Irish forebears may have married survivors of the wrecks of Spanish Armada ships on the Irish coast. This often expressed theory about the origin of the dark haired and eyed "Black Irish" is, it is said, supported by very little evidence. My wife, whose late father could be described as "Black Irish," has no trace of Iberian in her DNA. Perhaps in her ongoing genealogical research, which includes my family as well as hers, she'll find where there's--to borrow a book title from John Lennon--A Spaniard in the Works. * When we were in England, from 1951 to '54, my dad got an historical map of Hertfordshire, the county where we lived. Not too far a drive from our house (well, nothing in Herts is too far a drive), according to the map, there was a dotted outline labeled "Scales Castle." We got into our Austin A40 and went there, finding nothing but a pasture. I now know that the castle belonged to the holders of the de Scales barony, descendants of a Norman nobleman who arrived in England with William the Conqueror. I also know that I am almost certainly not descended from the noble de Scales family (the barony was terminated during the reign of Richard III, as the family were at the time on the losing side of the Wars of the Roses, although there have been attempts to revive it). During my first year of law school (1967-68), while on a weekend afternoon stroll, I went into the Widener Library, found the reference section, and in it the Century Cyclopedia of English Names. In the book I found "Scales" followed by the notation "A-S", which I took to mean Anglo-Saxon. It then said the name meant "dweller in the hut," a "scale" being a crude lean-to hut or shelter. A more recent source repeats that story of the name's meaning, but gives its origin as not Anglo-Saxon, but Scandinavian. Many Vikings settled in North-West England during the tenth and eleventh centuries after being expelled from Ireland by Cearbhall and Brian Boru. It's believed that these Viking immigrants from Ireland are the forebears of most, if not all, of the people named Scales in England. ** I've seen two versions of how the French word napier became a Scottish surname. The one I don't believe, because it is the more romantic, is that the first to bear the name so distinguished himself in battle that the King said, "Tha hast nae peer [no equal]." The one I believe is that the family were linen keepers, perhaps for the royal family, and took the French word for such as their name. Napier can also be an English name, but my father believed that his grandmother was somehow related to John Napier (1550-1617), the Scottish philosopher and mathematician who discovered the principle of logarithms and invented the first crude slide rule (a device still used by my generation during our school years, but now supplanted by the electronic calculator), called "Napier's bones." *** The term "Hillbilly" was given to Scotch-Irish settlers in Appalachia because of the popularity among them of the name William, a popularity stemming, no doubt, from the victory of William of Orange's army over the Catholic rebels at the Battle of the Boyne. King William is also the source of the term "Orangemen" for Northern Irish Protestants. **** I've now learned that Woods can be either English or Scottish. Rush is commonly English, but is found in Ireland as a derivative of several Gaelic names, or may be an Anglicization of a German name. It's an oral tradition in my mother's family that we're descended, through my great grandmother Ellen Susan Rush Miles and her mother, Susan Woods Rush, from Benjamin Rush, physician of the Continental Army and signer of the Declaration of Independence. This was reported as fact in my great grandmother's obituary in the Tyrone Daily Herald. Unfortuntely, because of a lack of information available about Susan Rush, it's proved so far difficult to trace the lineage.